A monthly Welsh language literary and religious periodical intended for the young people of the Calvinistic Methodist denomination. The periodical's main contents were articles on religion and literature, reports on the activities of literary societies, poetry and reviews. The periodical was edited by Thomas James (1827-1899), Benjamin David Thomas (1827-1905) and the poet and historian William Davies (Gwilym Teilo, 1831-1892). 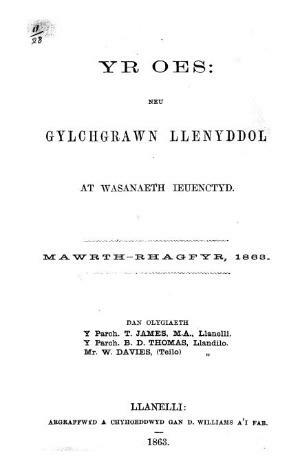 Associated titles: Y Cylchgrawn (1864).